For the first time ever, there are two Pixar animated features released in the same year. 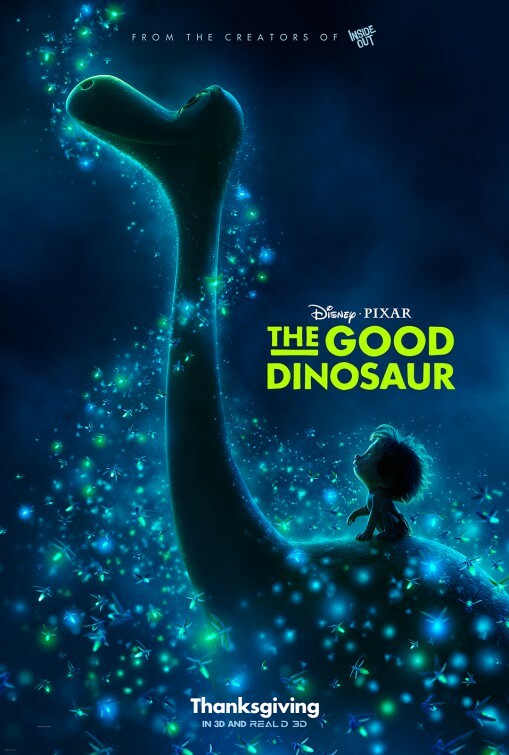 With “Inside Out” being one the best movies of the year, I had forgotten all about the studio’s sixteenth movie, “The Good Dinosaur” until recently. That’s odd since at one time I was quite interesting in seeing what Pixar would do if they went prehistoric. It’s a film that has changed creative hands and release dates (it was originally supposed to hit theaters eighteen months ago) many times and while it comes across as a simple and slight entry, I’d rather watch that than another cash-grabbing prequel or sequel. The movie starts off in space, millions of years ago. An asteroid belt outside of Earth sends a large rock careening toward our planet and knowing the movie’s title, we think we know what will happen. But then the asteroid is seen sailing above a herd of grazing dinosaurs. So much for extinction. Fastforward to million years later and we find a family of apatosaurus living in the west of what would’ve been the U.S., farming their land along a river. Among them is Arlo (voiced by Raymond Ochoa) the titular character and one of three children to Henry (Jeffrey Wright) and Ida (Frances McDormand), work their land and prepare their harvest for the winter. Cultivating the earth and building shelters, just like humans would’ve done. Timid and weak, Arlo tries to find his place amid the family responsibilities, but his siblings, Libby (Maleah Padilla), and Buck (Marcus Scribner), run circles around the runt. His father ensures Arlo he’ll eventually find his place in the family, but it’s clear this kid needs a hero’s journey to boost his confidence. That opportunity is thrust upon Arlo when he’s separated from his family during a violent storm that spits him out down river. Alone and terrified of the foreign terrain that surrounds him, Arlo begins his trek home. He is followed by a feral caveboy who becomes attached to him like a lost dog – in fact, Arlo names him Spot (grunts and growls supplied by Jack Bright) and although there is friction at first, the two become inseparable. 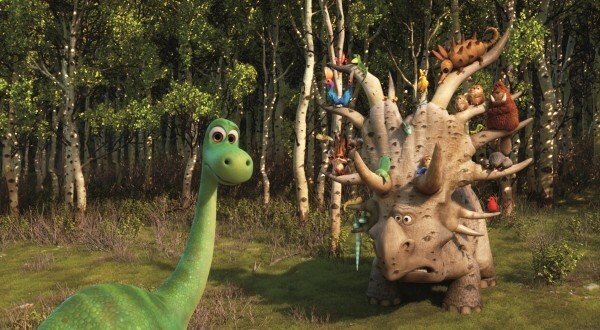 They travel the unforgiving wilderness together as Arlo tries to get back home to his family. As with every hero’s journey, our travelers will find a cast of supporting characters that are weird, silly, freightening and helpful. In that order, we meet a styracosaurus named Forrest Woodbush (voiced by director, Peter Sohn), who harbors a bizarre assortment of creatures (their introduction is a surprising highlight – one of them is named Dreamcrusher and reason is hilarious) on the horns of his rack. The pair also encounter some silly prehistoric groundhogs that allow them (and viewers) some laughs. There’s also a trio of fanatical carnivorous pterodactylus, led by Thunderclap (Steve Zahn), who become the story’s main antagonists. Help comes in the form of a trio of T-Rex cowboys, siblings Nash (A. J. Buckley) and Ramsey (Anna Paquin) and their weathered father, Butch (Sam Elliott, in full Marlboro Man mode), who chase off the pesky pterodactylus away. Arlo and Spot ride along with the cowboy ranchers who are tracking down their herd of prehistoric bison, or “longhorns”, as they call them. They become fast friends, sharing campfire stories and fending off feathery velociraptors (yep, that’s John Ratzenberger in there) and in the process help Arlo gain some confidence in himself. These characters offer added laughs, thrills and camaraderie, but ultimately the core of the screenplay from Meg LeFauve (co-writer of “Inside Out” and of the upcoming Marvel Studios “Captain Marvel”) focuses on the loving companionship Arlo develops with Spot. Anyone who’s ever had a connection with a dog (sorry cat lovers, it’s just not the same) will get how such a relationship can pull on the heartstrings. Throughout their journey, LeFauve and Sohn provide some touching moments dealing with loss and grief that are genuinely earned. But there are also some moments where the score by Canadian composers, Mychael Danna and Jeff Danna, swell to a “feel this” crescendo that is really manipulative. It’s during these moments where the material feels insincere and kind of generic, like a straight-to-DVD animated sequel from the 90s that tries to heavy-handedly repeat certain beats. That’s definitely a problem, especially when my eyes were dry during several scenes I would typically tear-up at. Instead of feeling the movie, I found myself noticing exactly where and why LeFauve and Sohn were going with the story. I appreciate the fact that this is a story that’s clearly geared toward younger children, helping them register feelings such as: fear, doubt, courage and love, but how it goes about doing it is kind of limiting if you’re not watching it through a child’s eyes. Sure, it’s a simple story and that could be just fine, but it includes one too many Disney tropes – the biggest one being the death of a parent (ugh), but even some of the supporting characters feel too repetitive. Surprisingly some of the voice work for the antagonists of the story feel really oddly stereotypical. For some reason, both the pterodactylus and the velociraptors have dimwitted redneck voices – at least that’s what it sounded like – and it felt too recognizable and blatant (even off-putting), taking me out of the movie. Although predictability is definitely one of the film’s flaws – how many animated features have included “face your fear, find your courage” as a theme? – the movie has its enjoyable moments. Granted, there was one laugh-out-loud scene involving some strange fruit which completely caught me by surprise, but that’s one scene that comes to mind. That being said, what I found completely absorbing about “The Good Dinosaur” was its gorgeous detailed visuals. The aerial view of landscapes, the snow-covered mountain ranges and the golden prairies are absolutely stunning. I immediately noticed how incredible the sun’s reflection off the photorealistic water was, giving the settings an animated style like no other Pixar movie before. The only problem with that is how contrasting the cartoony characters are alongside such a realistic atmosphere. If only the animators found a way to meet halfway between the life-like environments and the characters that look like they walked out of a “Land Before Time” movie. The production history of the movie was scarred with delays that may have played a factor in some of my problems with the movie. There was a director change (after Bob Peterson, co-director of “Up” was stuck) and a producer change (John Walker left to go work on “Tomorrowland“) and a complete story revamp, resulting in a total of six writers credited. 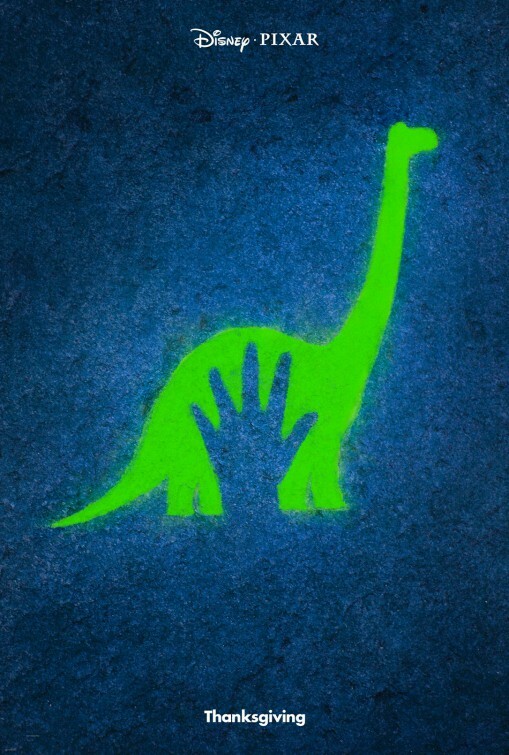 That many hands in the creative pot, finds “The Good Dinosaur” come off as a slight film that’s simply good, but not great – despite the potential for greatness. 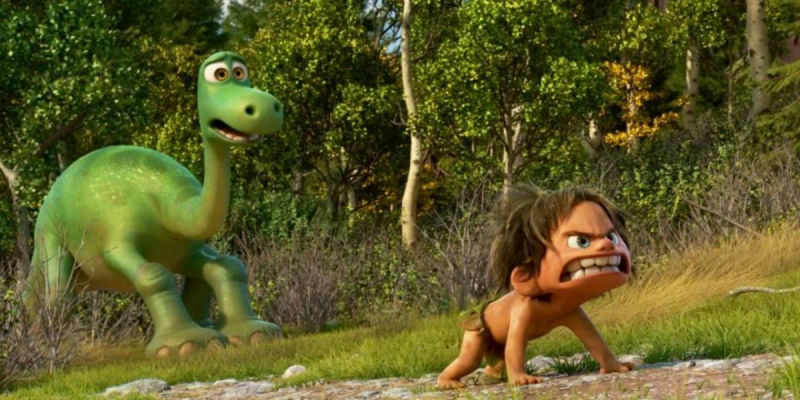 As with most animated features from major studios, there is an animated short prior to “The Good Dinosaur. Pixar resurrected that 20 years ago with “Toy Story” and they continue to produce the best animated shorts – well, except for this summer’s “Lava” which was attached to “Inside Ou”. 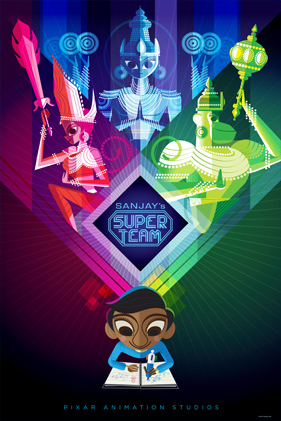 This 7-minute animated short, “Sanjay’s Super Team” is very good. It’s funny and clever and tells its story well within its times frame. Directed by Sanjay Patel, who tells a story from his own childhood about a boy conflicted with his modern world interests and the ritual Hindu traditions of meditation stressed by his father. The sweet tale becomes quite imaginative when the boy’s daydream transforms stoic Hindu gods into action superheroes. It’s the kind of short where you wish for a feature and that’s a good sign.